DC-Area Business Continuity and Disaster Recovery FAQ | ATI Solutions, Inc. What is disaster recovery as a service (DRaaS)? 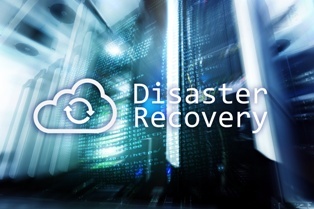 Disaster recovery as a service (DRaaS) uses third-party server hosting and cloud resources to restore business operations after a catastrophic event. The service provider backs up the company’s vital data, replicates production and processes on a temporary infrastructure, and migrates back to the original server after the threat has passed. When done correctly, DRaaS allows clients to transition between environments seamlessly and can even protect against future outages. Continuous improvement. A company’s digital profile is always in the process of changing, whether with consolidation, virtualization, or upgraded hardware. This makes maintaining a strong disaster recovery strategy difficult, as backup environments must reflect every adjustment made in the data center. DRaaS solutions are designed to keep up with this rapid rate of change and ensure that the business is backed up with every innovation. Flexible options. We understand that disaster recovery needs may vary depending on the size and nature of a business. Whether you choose to protect your entire environment or just the vital functions of your business, we can create a solution that is tailored to you. A safe location. Colocation providers are less likely to suffer the immediate effects of a natural disaster, as they are in protected locations with no need for access to foot traffic. From these vantage points, we can implement our clients’ disaster recovery plans quickly after the interruption occurs, allowing business to continue in a safe secondary environment. Optional IT resources. Most IT teams do not have the resources to maintain operations while implementing recovery solutions. Our professionals can create and test recovery plans for small and medium-sized businesses that will be ready and waiting to deploy after a disaster. We can ensure that you have a fully operational backup environment while your original environment is under repair, and can implement failback when your original environment has been repaired. Owning or leasing space for a secondary data center. Monthly costs associated with power, cooling, and internet bandwidth at the secondary site. Purchase or lease of servers, storage, and network equipment for the secondary site. Travel to and from data centers or onsite staff at the secondary data center. When choosing a DRaaS provider, it is vital that you trust the technology company that will store and implement your recovery plan. Our DC-area data centers offer all the power, connectivity, protection, and security you need in a location that’s close to home. Contact us today to get more information about how our data centers can serve your needs or set up an appointment to tour our Chantilly or Rockville facility.